Sunrise Bay is a newer Active Adult community in Little Egg Harbor. 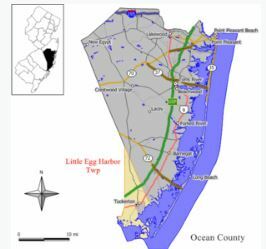 It’s located in Little Egg Harbor near the Garden State Parkway exit 58. This is a popular community because it;s just minutes from Great Bay. Enjoy local activities such as fishing, boating, golf, shopping, dining and much more. In addition, there is a county golf course only minutes away. This is a quiet active adult community which offers affordable homes and a great life style. In addition, your pets are welcome here. There’s a homeowners association, therefore a monthly association fee. In fact, it has a very low monthly association fee which covers lawn maintenance and snow removal. As a result, you won’t have to do these chores. There are 250 detached homes in Sunrise Bay, and they were built between 2001 and 2007. The homes offer either 2 or 3 bedrooms with a 1 or 2 car garage. Seven different models were available, and generally, the homes are between almost 1,300 sq ft to over 2,200 sq ft. Home prices are generally the mid $100,000s to almost $300,000. Additionally, there’s a well equipped fitness center. The 10,000 square-foot clubhouse is the central hub of Sunrise Bay. Inside there’s a multi purpose room, in addition to card rooms and a computer room. Also, there’s a billiards room, and arts and crafts. You’ll find clubs, trips and social gatherings that will keep you involved. Outdoors you’ll find tennis, bocci and more. When the weather gets hot, relax in the outdoor pool. The Ocean County transit provides bus transportation to seniors (age 60 and over). 12 local bus routes to shopping, other adult communities and more. Furthermore, the Reserve-A-Ride Program provides non-emergency medical transportation to medical facilities in Ocean County. Advance reservations are necessary, however they do charge a small fee.